“You can’t keep doing shows that don’t bring in audiences, you’ll lose money. Lose money and you lose the theater. Lose the theater and you lose the company. And who wins if you lose the company?” All of which makes perfect sense if we were in the business of making money. But we’re not. 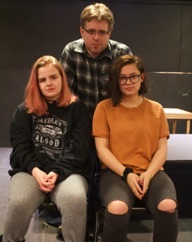 We’re in the business of making art and making a difference which generally involves working with teenagers and committed adults on all sorts of art—from the library of Scarpelli-Kehde musicals to the darkest plays from the mind of Kehde alone. We share the art, teach the art, show how the art is created and, perhaps most importantly, show how to be an artist in a world that tries its hardest to keep us from being one. Next weekend we’re offering two evenings of great performances in plays that are guaranteed to lose money and I’m proud of both of them. We’ll be starting the evening at 7 with a play we’ve been performing since 1998: The GirlsRoom. The story of 4 high school girls who meet every day in the school bathroom— three of them having been sexually assaulted by fellow schoolmates— and how it changes them over the course of a year. 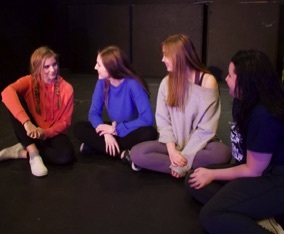 Four veteran CYAC actors, Afton Myers, Susannah Atkins, Grace Javins and Amanda Skidmore, take on the roles and it’s stunning to watch. 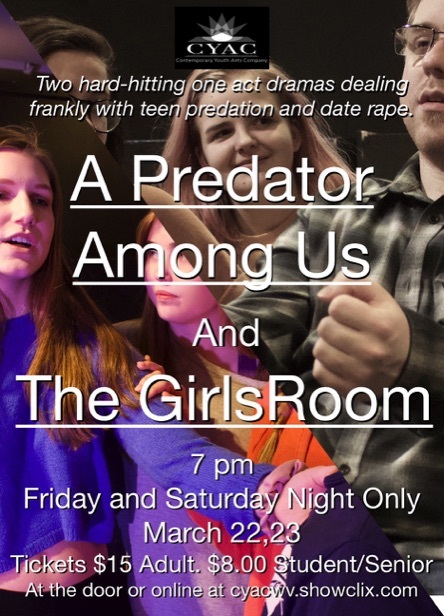 Sometime around 8 we’ll begin “A Predator Among Us”, a sickening depiction of just how easy it is for an older predator to groom a teenager for sexual exploitation, online and off. Once again our cast is brilliant: Nik Tidquist, Faith Medley and Sierra Hadley; and the production is haunting. These are great plays but, honestly, I can’t in good conscience hype them in typical broadway fashion because I’ll not exploit the victims that we all know must live with these terrible traumas. Except for a few posters in the windows of the theater, and a graphic on the internet there won’t be much in the way of publicity. But, trust me, these are really good pieces and no one who sees them will be left unaffected especially the young victims among us who think that it only happened to them. So, for these shows this weekend only, we’re going to make the price of admission entirely up to you. If you have the money and want to pay the standard price of $8.00 for student/senior or $15.00 for adult, that’s great. If you only have a few bucks, that’s okay and if you’re totally broke, you’re still welcome. And yeah, we’ll probably lose money, but you’re going to see some great performances and some of the kids who might need to see this and couldn’t otherwise will too. 7pm Friday-Saturday, March 22-23. CYAC Theater 2nd Level, Charleston Town Center.